Product: Mashers Elika 60ml Clear Disposable Plastic Square Party Dessert Cups – Packs of 50 was added to cart. 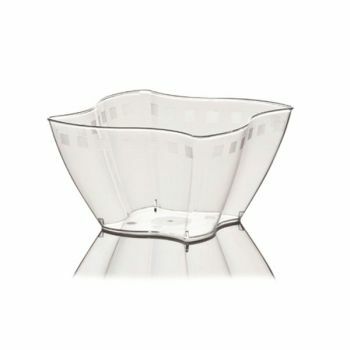 Disposable tableware at its very best, these Clear Plastic Dessert Bowls from Mashers Elika Collection will make a stunning addition to any buffet, banquet, or table setting. Made from robust food grade plastic, they feature an eye-catching curved design, and geometric detailing for added designer appeal. Perfect for serving puddings, desserts, canapes, tapas, and dipping sauces, these premium quality disposable party cups have a capacity of 60ml, and they are available to purchase in packs of 50 or 600. Larger 100ml and 150ml cups are also available in the Elika Collection.